Surgeons have tried for centuries to help patients suffering from heart disease or trauma, but only recently has their desire been matched by knowledge, experience and technology. Here are four new areas of advancement in heart care. 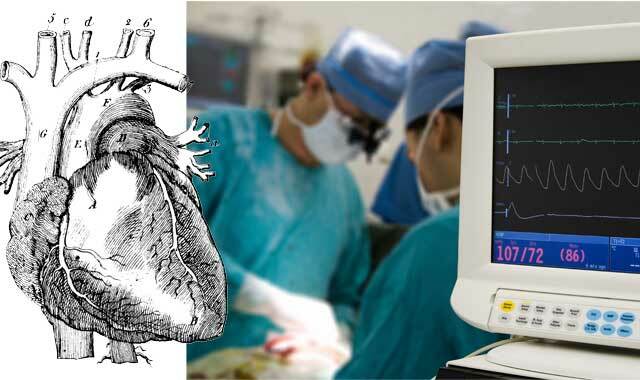 Just 60 years have passed since the first successful bypass surgery was performed in the United States. Yet the procedure has remained fundamentally the same: When less-invasive stenting in a hospital’s catheterization lab is not a viable solution, veins harvested from the patient’s legs, and arteries taken from the arms or chest wall, are used to replace blocked heart vessels. Dr. Cynthia Steimle, a cardiovascular surgeon at Sherman Hospital in Elgin, has observed a major improvement in equipment quality and surgical techniques since her career began 16 years ago. Until relatively recently, veins were surgically cut from a patient’s legs or arms, leaving long, disfiguring scars, sometimes causing patients to complain more about the pain in their legs than the actual bypass surgery. In the beginning, cardiovascular surgeons performed “beating heart” surgery, in which the heart continued to pulse while the surgical procedure was taking place. The introduction of the heart-lung machine in the 1950s was a huge step forward in helping surgeons to work effectively, with less chance of complications. It allowed the heart to be stopped during surgery, with the machine taking over the functions of the patient’s heart and lungs. For more than 30 years, stopping the heart during bypass surgery was the standard. In the past few years, however, new devices that stabilize the heart have been developed, making surgery on a beating heart possible. Other advancements have aided in diagnosing and treating heart disease. For example, ultrasound is now used to assure that the patient has no serious plaque buildup that might break up during the procedure, increasing the risk of stroke. She points out that cardiovascular surgeons have learned so much, not only about surgery, but also about aftercare, that it’s now possible to offer bypass surgery to most older, sicker patients, rather than leaving them to suffer pain and reduced quality of life. “Results are really remarkable, and many patients can have the chance to feel better,” says Steimle. While bypass surgery itself has remained basically the same, angioplasty, used to alleviate stenosis (narrowed or blocked arteries), has changed drastically since its introduction in the late 1970s. Today, stenting plays a major role in preventing and stopping heart attacks. Prior to development of the stent, the main interventional treatment was balloon angioplasty. In this procedure, a balloon compacted onto the end of a small, straw-like tube, called a catheter, is fed by wire through the patient’s vessels via a small IV in the leg, wrist or arm. Surgeons use real-time X-rays to determine the exact location of the blockage, position the balloon and inflate it, opening the artery and loosening the blockage. However, with balloon-only angioplasty, there was an unacceptable rate of restenosis, or repeat artery blockage. Adding a drug-eluting stent has lowered the risk of restenosis to less than 5 percent, says Dr. David Bromet, an interventional cardiologist at Provena Saint Joseph Hospital in Elgin. As chief of cardiac services, Bromet has seen firsthand the tremendous impact stenting has had on patient survival rates and on quality of life. Stenting is ideal for patients with less severe blockages. In severe cases, stenting can be the first step in stabilizing the patient, who then may be scheduled for bypass surgery within a day or two. In some cases, patients scheduled for a double or triple bypass procedure may be candidates for single bypass, with stents completing the treatment. Non-cardiac blockages can include peripheral artery disease (PAD) in a patient’s legs. The same stent procedure used to stop heart attacks can be applied to relieve leg pain or ulcerations caused by PAD. But treatment doesn’t stop there; the underlying causes of any blockage must be addressed. Obesity, diabetes, drug or alcohol abuse, smoking, high cholesterol and high blood pressure can influence the development of blockages. Factors beyond control, such as genetics, also play a role. Emergency responders educate the public on the “golden hour,” that critical window of time for saving a patient’s life and minimizing heart and brain damage caused by coronary thrombosis and stroke. Emergency room personnel, such as those at Saint Joseph, also observe a window of time critical to patient survival. From the moment a patient experiencing chest pain or other symptoms of a heart attack comes through the doors, to the time that person is catheterized, averages 90 minutes nationwide. Hospital emergency rooms strive to shrink that window to 60 minutes or less. Blocked blood vessels aren’t the only cardiac health risks. The delicate valves that control blood flow within the heart’s vessels also are vulnerable to disease and the effects of aging. These can calcify and stiffen, weaken and begin to leak, or fail completely. Significant advances in the treatment of valve disease have made an enormous difference, not only in repairing or replacing valves but also in the procedure’s impact on the patient. Dr. Timothy Votapka, cardiovascular and thoracic surgeon at Advocate Good Shepherd Hospital, in Barrington, says that a minimally invasive technique was introduced for the treatment of valvular heart disease several months ago. Both aortic and mitral valves can be replaced or repaired, with minor changes in the method. Neither operation requires opening of the sternum, or breastbone, which necessitates the six to eight weeks of limited activity following open-heart procedures where this is done. Several years ago, the surgical robot was used for cardiac valve surgery to minimize incision size and reduce recovery time. Surgeons soon realized it wasn’t the robot itself that gave them the advantage, but the long instruments developed for the robot that allowed the surgery to be accomplished through small incision. By modifying the instruments so that they can be used manually, heart surgeons accomplish the same results without the need for the bulky, expensive robot. Recovery is significantly quicker using this minimally invasive procedure, with patients remaining in the hospital for two or three days. Patients also experience reduced pain after the first day or two, less blood loss and lowered risk of infection. The results of both procedures are comparable, depending on the type of replacement valves used. When tissue valve replacements are used, no blood thinners are prescribed. But tissue valves are less durable than mechanical valves and may start to degenerate after 10 to 15 years. If mechanical valves are used, patients will need to take blood thinners for the rest of their lives, but the risks of repeat surgery are extremely low. With mitral valve surgery, a successful repair doesn’t require blood thinners and almost never requires additional surgery. Diseased valves can cause atrial fibrillation (A-fib), a condition in which errant electrical impulses cause the heart to beat irregularly and, often, much faster than normal. A-fib can make a person’s heart race at rates well over 100 beats per minute, even when at rest. Some patients may not feel the increased heart rate, but other symptoms are fatigue, loss of energy, breathlessness after average exertion and a tendency to tire easily. When A-fib occurs episodically, it’s called “paroxysmal” or “intermittent,” and when constant, it’s referred to as “persistent” or “chronic.” Both types can be treated successfully with ablation. In this minimally invasive procedure, a fine catheter is threaded up through a vein in the patient’s leg and maneuvered to the area in the heart responsible for the abnormal electrical impulses. The most important areas are associated with the pulmonary veins that drain blood from the lungs back into the heart. The catheter is used to cauterize the tissue in a circle around the veins. This creates a line of scar tissue that acts as an insulator, blocking the abnormal electrical impulses that cause A-fib. With ablation, the success rate for the first procedure is about 60 to 70 percent. About one-third of patients may need a second round. After that, the A-fib is expected to be under control in more than 90 percent of patients. For chronic A-fib, in which the heart is continually in the abnormal rhythm for many months or years, Kessler says approximately 80 percent of patients experience relief after multiple procedures. Implanting a pacemaker to treat A-fib is usually done as a last resort, and generally considered only if the patient isn’t a viable candidate for ablation. While heart disease continues to be the No. 1 cause of death in the United States, advances in surgical treatment over the past 50 to 60 years may ultimately bring that unacceptable situation to a tipping point. Until then, fundamental bypass surgery, supplemented with an increasing array of innovative, minimally invasive procedures, is already making a difference in the length and quality of life for millions. This entry was posted on Wednesday, June 27th, 2012 at 12:00 pm	and is filed under Health & Fitness, Top Posts. You can follow any responses to this entry through the RSS 2.0 feed. Both comments and pings are currently closed.